Vacation year round. Enjoy beautiful sunsets from the deck or sun room, large master bdrm with walk in closet. 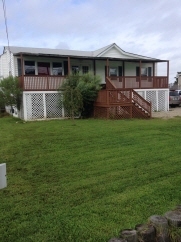 Situated on fenced half acre lot in wonderful community of Poquoson. Back River and Boat Landing with deep water access at the end of the road. Bring your boat and jet ski!